Oh, Dads. How they love their snacks and fine leather goods. Picking things for them can sometimes be a challenge, because they’re really good at the whole “wow, this is great!” and then never ever use it routine. When it comes to your Pop, you sort of need to channel into their psyche. Sounds absurd, but hey, it works. You gotta think about what they do, when they do it, and their level of commitment to such hobbies (something tells me that most guys aren’t too intense about their skin care routine, and likely won’t be using that men’s Clarisonic). Hence we have lots of gifts involving good eats, cool gear, and leisurely activities. 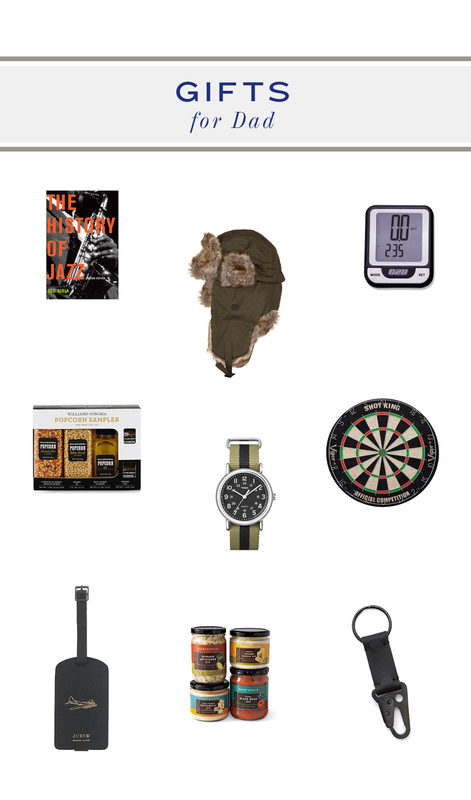 This entry was posted in Holiday and tagged activities, activity, Barnes & Noble, Biking, cycle, December, december 2014, Food, Gift Guide, Gift Guide 2014, Harry & David, JCrew, Leather, leisure, snacks, Timex, Williams Sonoma, winter 2014 by Gardenias & Mint. Bookmark the permalink.